This 1v1v1 attacking drill focuses on dribbling to beat an opponent. This is a great dribbling drill that is very competitive and great for a fitness training. Split; the team into 3 groups of 3 giving each group a different color. Assign each team to defend one of the three goals. 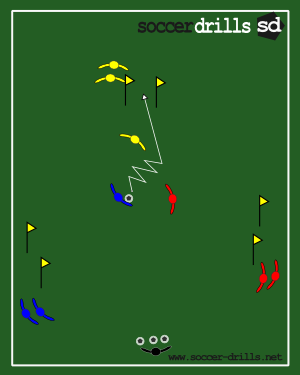 Place 1 player from each of the three teams in the center of the goals. The coach will start the game by playing a 50/50 ball into the middle of the grid. The team in possession of the ball can score in the 2 other team's goals, but must defend his goal. Once a goal is scored by dribbling through the goal, the player scoring the ball must pass the ball into the first player of his group. A new player from each of the other teams also steps up and pressures the ball immediately after the goal. First team to score 10 points wins. Encourage players to dribble to take defenders on. Encourage players to play with speed. Encourage feints and moves to get past defenders, but often speed and a quick change of direction will do the trick.